Marine plant life forms the basis for all ocean life. While many plant species find saltwater toxic, some have evolved to thrive in it. These species that live in saltwater have special salt excreting cells or a gelatinous coating that protects them from becoming saturated with salt water. Most marine plants are located along the coastal zones or, if they are in open water, in the eutrophic zone, the upper surface water of the ocean where sunlight can penetrate. Like all plants, marine plants require sunlight for photosynthesis. While salt is harmful to many plant species, some thrive in it — from the smallest plankton to the tallest kelp plants. Many have their own ways of expelling or protecting themselves from the salt. Phytoplankton is the single most important form of marine plant life. They are small, often microscopic, and have a lifespan of only one to two days. Phytoplankton thrives in all the oceans of the world, floating on the surface of the water or just below. These creatures require nutrients, such as iron, that seep up from the colder, deeper ocean waters. When the waters are too warm — during an El Nino, for instance — the plankton die faster, compromising ocean life. When they die, they sink to the bottom, where their remains collectively make up the largest storage of carbon dioxide in the world. In addition to phytoplankton, there are also nanoplakton and zooplankton. Kelp, a form of brown algae, grows in aptly-called kelp forests worldwide. Kelp lives along coastal areas and in the eutrophic ocean zone, usually never exceeding depths of 15 to 40 meters and never in water warmer than 68 degrees Fahrenheit. Kelp plants do not have roots, but rather holdfasts, root-like structures that allow the plant to cling to rocks or other oceanic structures for stability. These species have evolved to have bubbles growing along the stems — called gas bladders — that hold them upright. A type of brown algae distinct from kelp, rockweed grows along coastal areas. 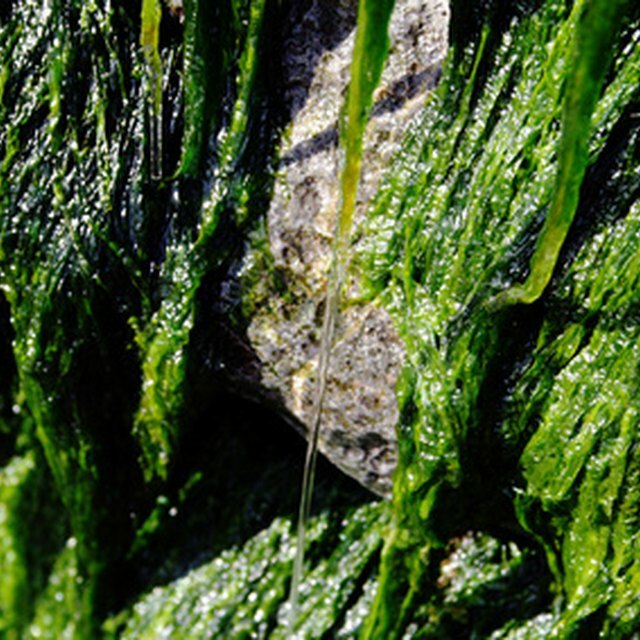 The physical structure of rockweed varies with location and salinity — it grows larger in saltier, calmer waters. Rockweed is a source of food and a hiding place for small invertebrates and fish like pollock — it sustains life on the bottom of the food web. As angiosperms — or flowering plants — seagrasses closely resemble terrestrial grasses. They grow in underwater meadows, often near shorelines along muddy or sandy bottoms. Seagrass species vary in size from the size of a fingernail to 15 feet tall. Seagrass meadows can include many species of seagrass, or be limited to only one. Seagrass provides food for animals such as sea urchins and crabs and they provide smaller lifeforms with protection from predation. Mangrove trees grow near salt water where soil may be rich or poor in oxygen; they are commonly found in estuaries. Mangrove trees can grow aerial roots, allowing the tree to breathe oxygen from the air if the soil is depleted. These hardy trees expel some salt through their roots but can tolerate salt in their tissues at a ratio of one-tenth the salinity of seawater. Excess salt is stored in leaves, where it is removed via specialized cells — or the specimen sheds the leaves altogether. Rae, Kara. "What Type of Plants Grow in Salt Water?" Sciencing, https://sciencing.com/type-plants-grow-salt-water-5527311.html. 19 April 2018.